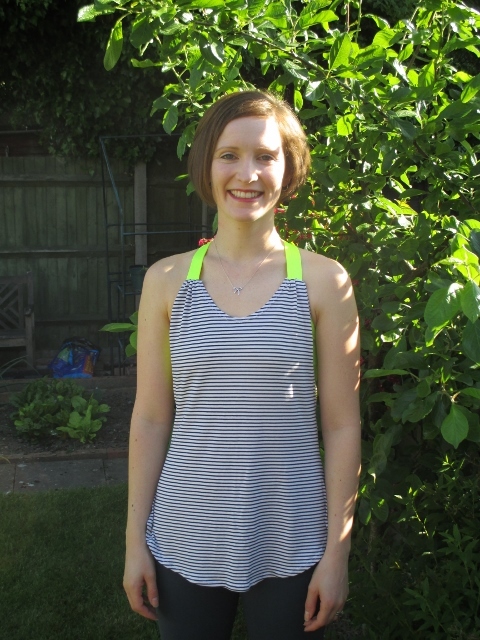 I’m so excited to share my latest handmade sportswear today, it’s had three exercise road tests. I insist on road testing sportswear before blogging so I can give you honest descriptions of functionality, sportsbra support, sweat wicking and other details that perhaps I should keep to myself. I pack in up to 5 hours of exercise a week so that’s plenty of time to check out what my fellow gym goers are wearing. Lately there has been a resurgence of the neon trend but toned down with neutrals. And so, the nautical neon combo For Papercut’s Pneuma pattern was dreamt up mid-press up! To the sports bra, I removed a smidgen from the front arm curve. In my featherweight pneuma this doesn’t bother me but in my Halogen sportsbra it rubs a little if I’m doing lots of arm movements. To the tank, I made a full hip adjustment to prevent the back part of the tank riding up. I guess this is to do with my pear shape, most of which I carry in my behind. And the very obvious change… the straps. 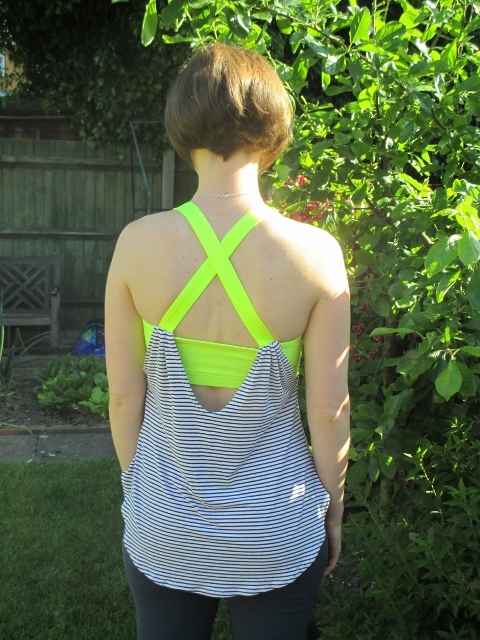 I attached a single strap at each shoulder with a cross at the back to prevent slipping and because I really like funky back straps in sportswear. The four straps of my previous makes get tangled when I put them on, the plush bra elastic gets sweaty and double straps at each shoulder means shoulder muscle (can’t for the life of me remember the name for this muscle from anatomy class – hubby thinks ‘traps’) pain if I wear it for too long. Remedying all my gripes about my previous makes in one go… these straps are made using regular elastic covered with the same lycra I made the sportsbra from. Sweaty factor reduced to the same as the rest of the sportsbra – I prefer an even feel to sweat rather than troublesome areas. The wideness of the elastic means there is no flipping over or tangling. And, now that I’m happy with the compression the sportsbra gives, I had more confidence to not make the straps as tight so shoulder muscle ache is reduced to that just caused by the workout rather than additional resistance of working against the straps. Inside? Well, this lycra had plenty of recovery and resistance so doubling the layers like I did on my previous Pneuma sports bra was not necessary. Instead I used some power mesh swimwear lining from my stash just because it feels nice. The fact the functionally of this make scored highly and the colours worked as well as they did in my vision was enough for me. To receive three compliments on it’s first gym session knocked me over the edge! 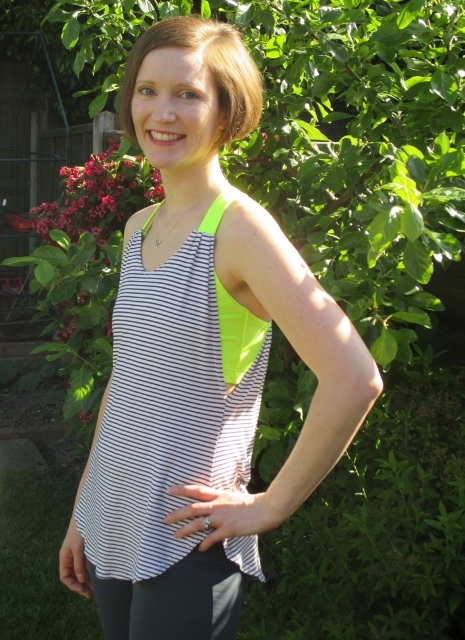 This entry was posted in Pneuma, Sewing, Sportswear, sportswear fabric. Bookmark the permalink. I guess there are places where neon is acceptable and places where there’d be a lot of staring! Thanks for commenting. Thank you… trapezius, yes it’s all coming back to me now! I do work out harder when I feel good about what I’m wearing. LOVE this top! The fabrics you chose are perfect- great gym look! Thank you Trish. I had fun shopping for neon lycra! It looks brilliant. Very professional. This wouldn’t look out of place at the nearest Lululemon store! Yes, it is absolutely only for those of us who can rely on compression alone for sporty activities. This is just so fantastic – the fabric combo is spot on.